On the 19th December 1679 in the alley by the Lamb & Flag the poet John Dryden was nearly done to death by rogues hired by the Earl of Rochester. In "Essay on Satire" Lord Mulgrave had attacked the Earl of Rochester. 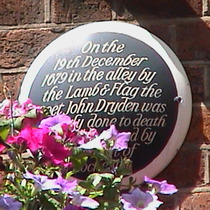 Rochester chose to believe that Dryden was responsible for this and so hired some ruffians to duff up Dryden in Rose Street as he returned from Will's coffee house to his own home in Gerrard Street. To add insult to injury this attack was then held to reflect badly on Dryden. See Bill Peschel for more detail plus the poetry involved. This pub and the nearby streets are the subject of a post by the great A London Inheritance. LCC 1911 Thomas Stothard, 1755 - 1834, painter and illustrator, lived here.